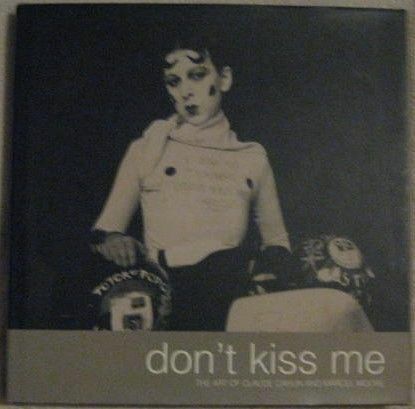 First edition, first print hardback of DON'T KISS ME (The Art of Claude Cahun and Marcel Moore) edited by Louise Downie and published by Tate Publishing in 2006. The book is in near fine condition (black cloth boards with white lettering to spine) with no significant wear. The dust jacket, which is not price clipped, is in very good condition with light creasing to the top and bottom of the front and back covers and spine. Internally, the pages are clean and tight and there are no tears and no inscriptions. Don't Kiss Me examines the artists' lives and practice, their theatrical, literary and perfromance activities; their relationship with the Surrealist movement; and Cahun's photographic technique. The book also includes the first thorough account of the Resistance activities, imprisonment and attempted suicide of the two artists during the Occupation. The extensive illustrations encompass not only Cahun's iconic images, but also previously unseen photographs, manuscripts and ephemera, as well as drawings by Moore. The wealth of new material in this compelling survey makes it essential reading not only for all those who wish to learn more about Cahun and Moore, but also for anyone with an interest in the history of photographic art in the twentieth century, in gender studies or in Surrealism.